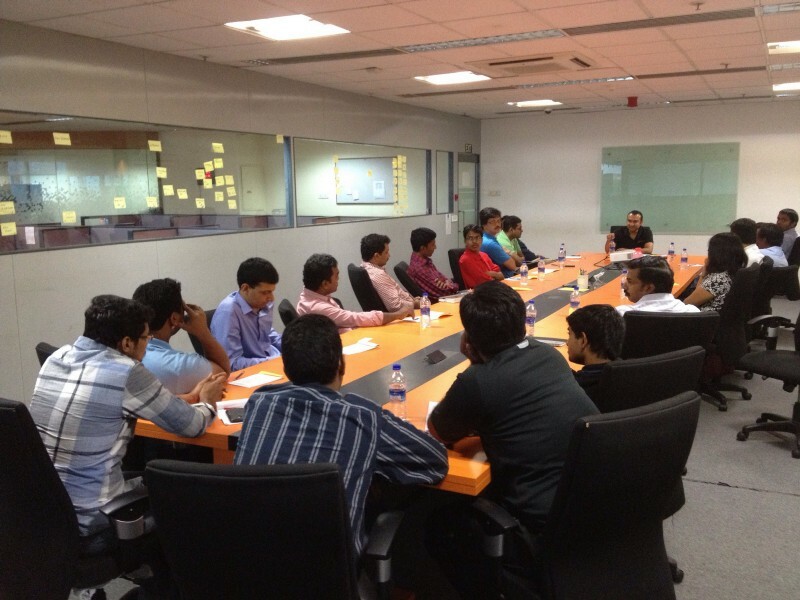 Last Saturday we had an awesome teardown roundtable in Chennai moderated by Suresh (KiSSFLOW) and Bharath (FreshDesk) .. This was my first direct experience with the teardown. Six companies participated (PickYourTrail, FoodEngine, SysCloud, CustomerLabs, Tagalys, and ManageArtworks). While the entire session of 4+ hours was extremely intense, I want to quickly share with you in 10 minutes (almost) of what happens in a Product Teardown. Teardowns are coming to your city. Please apply here (Limited Seats). The iSPIRT product teardown (esp. for SaaS websites) is primarily structured around 5 key principles outlined below. What is the problem you are trying to solve? Who is your target user? It is critical to have a clear picture of your target user persona, their problem and how your solution solves their pain point. Essentially establish your problem-solution fit and articulate it for the customer journey from Discovery → Conversion. How do customers find your product? Is it through google search? Is there a channel they frequent? Have you identified your TAM (total addressable market), SAM (serviceable addressable market) and SOM (serviceable obtainable market)? Use this model to help identify strategies to have your SOM discover your product. Your website is the first & most important way to establish trust & relationship with your customer. This is true even if you don’t use inside sales. What is your first message or hook for your target user persona? Are they able to connect your product with their problem and the path through which they discovered your product? Are they able to understand how your product solves their problem, and why they should use it? Once they identify with your message and establish trust & credibility the rest becomes easier. If the cost connects, signup happens!. Post signup, is there a WoW first experience? Whether it is a try & buy experience or a first purchase onboarding, it is important for customers to experience some instant gratification for the grueling journey they just went through. Believe me, making a purchase decision can be taxing. If you can make this journey pleasant and the final destination fantastic, you have a winning product . Do go through the video above and hear Suresh’s simple explanation. And if you like what you hear remember you can apply here for a teardown in your city. While I still have your attention, we are excited to announce that we would be launching the third edition (2017) of the India SaaS Survey in a week from now. This survey is an annual exercise conducted jointly by SignalHill and iSPIRT to gather valuable data for drawing insights which help various stakeholders in the ecosystem understand this space better. Please stay tuned to this space. We will be providing a link to this year’s survey very soon in an upcoming blog post. The amount of time & effort Bharath & Suresh provided to review and analyze each product before the actual teardown is simply inspiring. . to their commitment to the community. As Diwali marks a Joyous celebration and heralds a Prosperous New Year for all, we kick off a series of Product Teardown Roundtables to help our SaaS startups prepare for a successful year ahead. This series of PlaybookRT will focus on Guiding the customer journey from Discovery to Signup & Onboarding. The teardowns are being planned across our startup cities in quick succession (see tentative schedule below). We kickoff with a teardown RT in Chennai which will be facilitated by Suresh Sambandan (KiSSFLOW), Bharat Balasubramanian (FreshWorks). Apply to get your slot here. (Limited seats). Why are product teardowns important? For Explosive Growth! Why? Because the customers do this work for the startup. If this is to happen for your product it is important for your customers to have a clear-cut understanding of your product proposition, discovering it’s ROI and a WOW no-brainer experience of signing up and using it. Our product teardown session is focused on exactly this evaluation for your product. Using our community of peers and leading practitioners, you would go through an intense journey and visualize how your potential customer discovers, understands, signs up and connects the product proposition and ROI to their needs. If you do a damn good job about this, you gain a big advantage because you don’t have to work so hard for marketing leads, getting you further on the path to explosive growth. In this playbook series, we look at how to get your messaging right, and building a website and signup/on-boarding flow that converts with very little human intervention. This roundtable would begin with a deep dive into the company’s Idea, Discovery Process and navigate through the Landing Page, Sign Up, and its “Wow” experience. The format of the playbook is built around quick 10 minute demos, followed by peer-feedback moderated by SAAS founders & experts who have already built successful SAAS businesses. You can read some of the previous teardown experiences from the founders who participated. If you are keen to attend this RoundTable, do let us know by filling in your details here. We will confirm your seat subject to availability. All RoundTables are conducted pro-bono. The only payment you have to make is to provide your undivided attention and active involvement in the process. Playbook-RoundTables are a dialogue and there’s no monologue. None! These are founder invite only events. Date, Time & Venue details will be sent along with the confirmation. Since there are limited seats, we would request you to kindly apply at the earliest. When I was a kid, the only goal that I had in my mind was to become a cricketer and play for India. But never did I get an opportunity to play beyond the gully cricket and few matches as part of the school cricket team and my cricket was just restrained to the park level. My dreams of scoring a century have now finally been full-filled. Playbook RT, something that started in the early days of iSPIRT, turns 100. This is my first century, the gully cricket ones not withstanding. Our elevator pitch — took us 15 sessions to get to this. As crisp as that sounds, it took us around 15 Round Tables to distill this elevator pitch, and truly understand our own product-market fit. This is the story of how it all began, and of the amazing journey, the lessons, the people who made it all possible. For those of you who love visuals more or are pressed for time, there is a photo-story at the end of this post — please feel free to scroll to the end of this post for that. 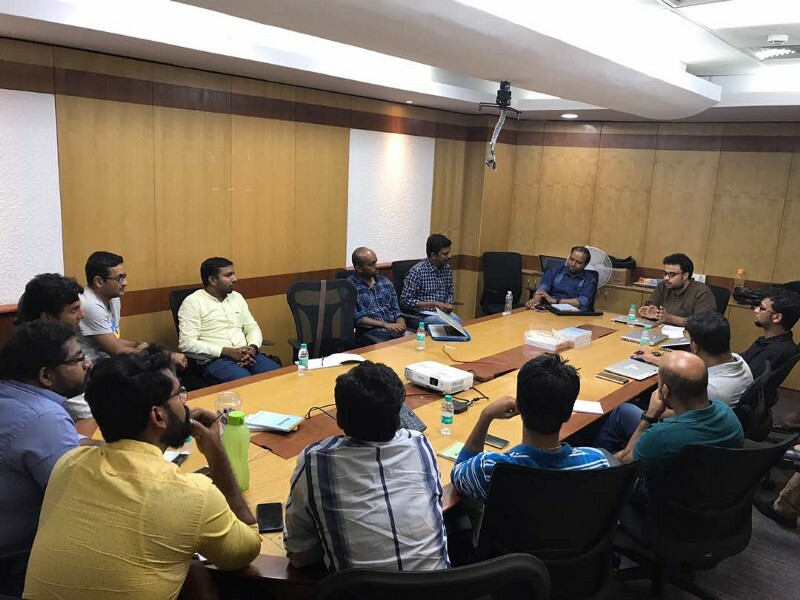 Inthe early days of iSPIRT, Sharad(iSPIRT) initiated the process of the mentoring program with Ashish Gupta(HelionVC), Aneesh Reddy(Capillary), Vivek Subramaniam(iCreate/Fintellix) in order to put together a mentorship program for product companies. We iterated over 10–12 calls about the format, audience, focus and how things will be run. Once everything was nailed down, Ashish took the lead of curating the first playbook and the facilitator was Shankar Maruwada(EkStep). You can see the level of planning which went behind the scenes of the first playbook. Pallav Nadhani(FusionCharts) & Ambarish Gupta(Knowlarity) were part of the first playbook and added lot of valuable insights and others benefitted from this learnings. Ashish was a splendid host for the first playbook. I still remember the yummy samosas and kachoris that we got during the break and I still remember Ashish helping his office boy in serving tea to all the participants. I was blown away by the simplicity and the humbleness of Ashish. Thanks to Nikhil Kulkarni(Flipkart) for capturing all learnings in a subtle way. 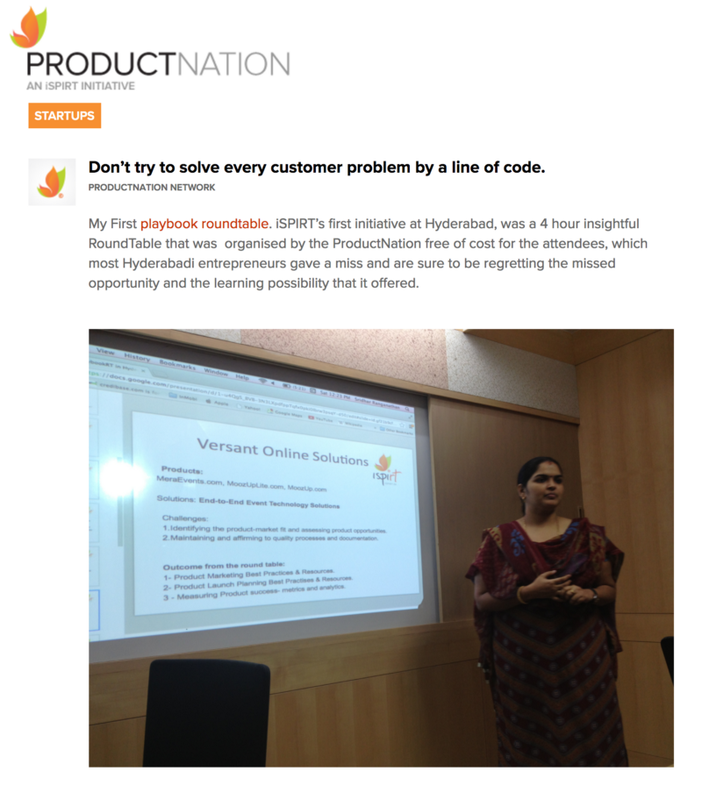 The next goal was to conduct Playbooks around Product Management & Sales in different cities. 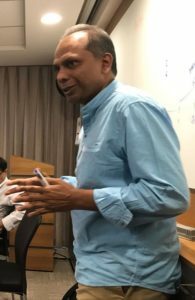 I remember Amit Ranjan(then Slideshare) & Amit Somani(then MakeMyTrip) helping us with the Product Management Roundtable in Delhi and Aneesh Reddy(Capillary) helped in curating the Playbook. 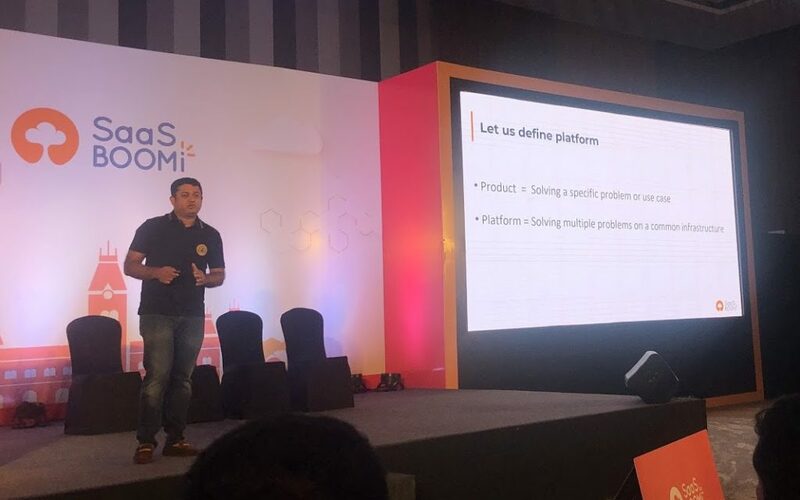 Ankur Singla(then Akoksha) then did a wonderful piece on Notes on Product Management — insights from Slideshare / MMT / ex-Google PM. Ashish Gupta also helped in connecting with Samir Palnitkar(ShopSocially)who kicked off the PlaybookRT in Pune. 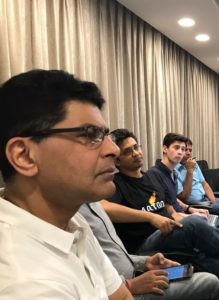 Sandeep Todi(then Emportant)helped with the blog on Challenges in Building a Global Product Software company from India. It was a little challenge initially to get the right audience, but we just got few good people like Mohit Garg(MindTickle) help in inviting few founders for this playbook. I got to read a wonderful blog post by Sridhar Ranganathan on Products and I did reach out to him to see if he could help us with the Playbooks. He liked the idea and Aneesh did the selling to him. 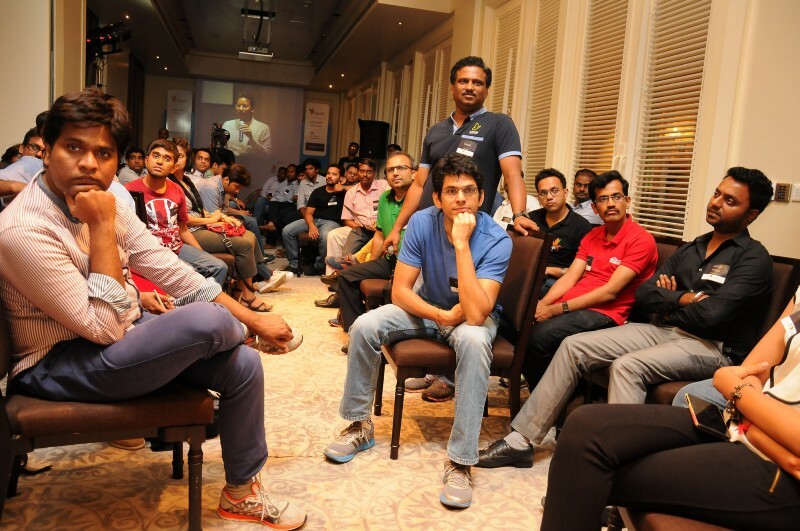 Sridhar travelled to different cities and did the first playbook for us in Chennai & Hyderabad. 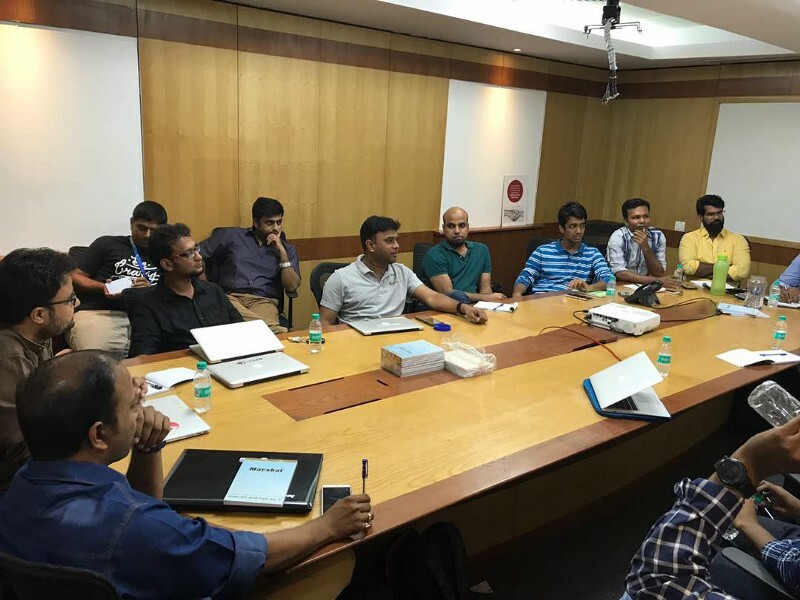 The attendance for the Hyderabad playbook was thin, but the session was very interactive and the 7–8 folks who attended, had a lot to take away from the discussion. Here is what was captured by one of the attendees Don’t try to solve every customer problem by a line of code. We did a late beginning for Mumbai and thanks to Avlesh(WebEngage) for helping us in starting the movement with Sandeep’s support. Avlesh disappeared in the middle of the playbook and he had lots of documents to sign as it was a saturday… But I remember Sandeep holding the fort till Avlesh came back and shared his learnings of building WebEngage. Organizing and hosting a playbook is no small feat. It has taken us a lot of time to put together the following checklist. Feel free to use it if you would like to put together something similar for your community. We have built new initiatives like Cohorts, etc using the same principles. There cannot be more than 12–14 participants. The sweet spot is 10–12 participants. Minimum number is 5. Adequate discussion should take place with the Facilitator on the topic. It should be sufficiently narrow. It should not be about batting as a whole but about how to play leg-spinners. There would be a Plan B by the Facilitator if the topic ends up being too narrow. It is wiser to err on the side of being too narrow, rather than being too broad. It is mandatory to for a first-time Facilitator to attend a PlaybookRT for at least one hour. Curator should discuss Facilitator checklist. This discussion should happen before selection of the topic. Four weeks advance notice should be given for PlaybookRT if it is not tapping into a pre-curated participant list (e.g. BEX or InTech50). This is to ensure cross-city participation. Postmortem call (30 mins) is mandatory. Participant feedback and other learning should be discussed in this call. At the end of the call Curator should assign an overall rating (on a scale of 5) to the PlaybookRT. 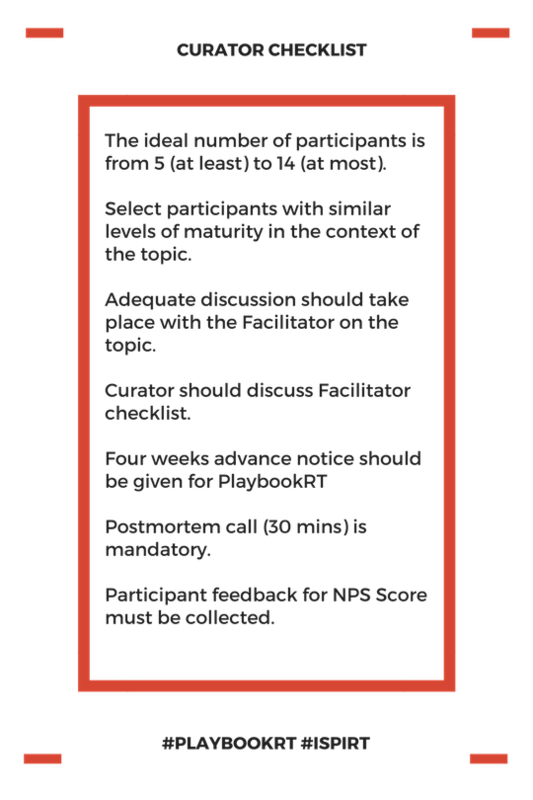 Participant feedback for NPS Score must be collected. You must select a topic that you are comfortable with. You must have expert practitioner knowledge about this topic. 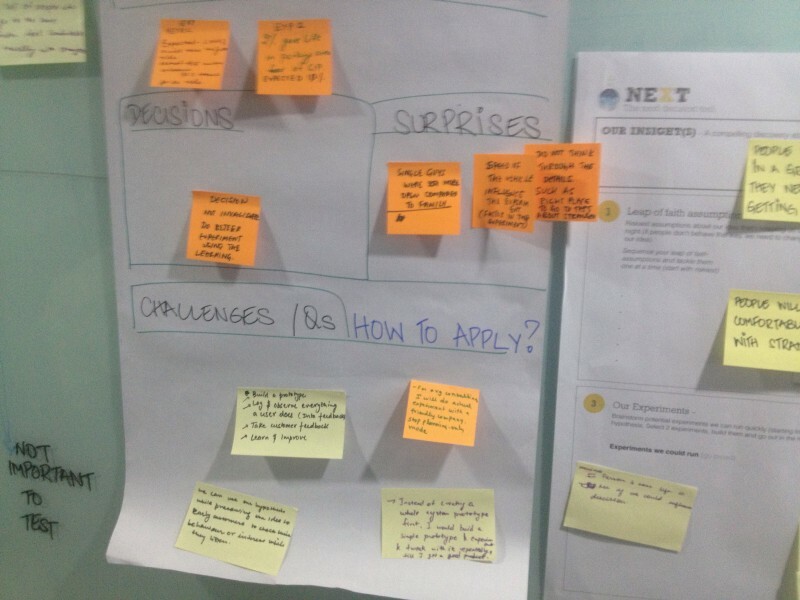 You should reach out to startups to scope out the specific topic areas you’ll cover. You should be part of the curation (i.e. shortlisting) of the participants… you must try and get participants at the same level. You must do the homework on the final participants. You must learn about the startups by visiting their website. You must also understand the challenges faced and expectations from the PlaybookRT (this information is in the form filled by the participant). Identify 2–3 participants that could be anchor attendees — folks who will trigger conversations and also add value to the conversations. 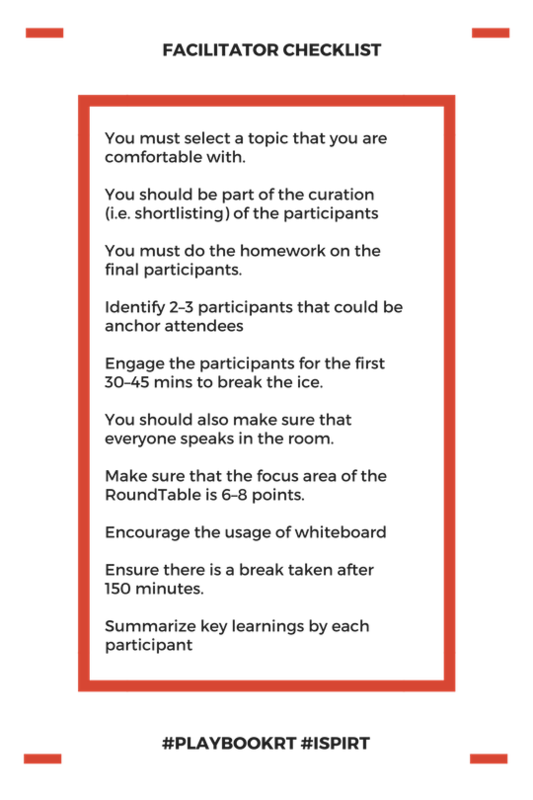 Engage the participants for the first 30–45 mins to break the ice. You should go beyond introductions — Something on the lines of: We are struggling to do xyz. The goal is to create an atmosphere of trust so that they spell out more details. Participants are continuously requested to chime in with their views. You should also make sure that everyone speaks in the room. For instance, Shankar Maruwada asks very specific questions to participants along the way. He is able to do this because he has done homework on each participant beforehand. Seating should be such that people can see each other. Make sure that the focus area of the RoundTable is 6–8 points. It is difficult for participants to retain more than. Encourage the usage of whiteboard with participants. This allows people to change position and brings energy in the room. Peer learning is vitally important. Don’t be a sage on stage. Share list of books/videos/tools that participants should use after the RT. Ensure there is a break taken after 150 minutes. At the end, summarise key learnings by each participant. Everyone speaks for at least 2–3 mins. 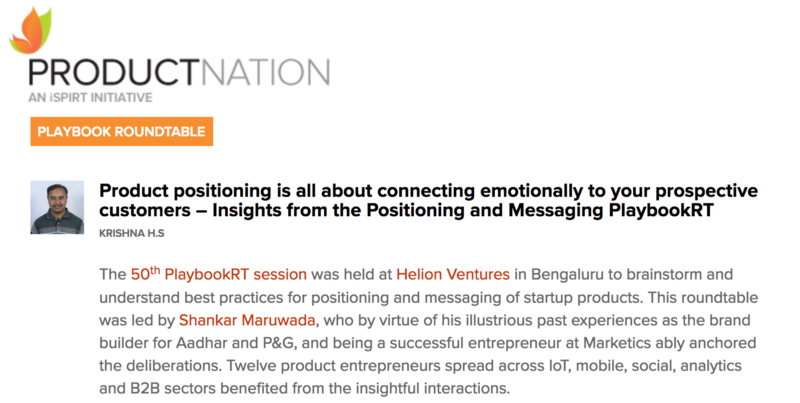 22nd #PlaybookRT — Solving a customer’s problem in a way your competitor is not doing, is the most memorable thing for your customer or partner by Pallav Nadhani. Shankar helped in putting together the 50th Playbook and it was good to get some folks who had attended the first playbook joining this one. Mavens are trusted experts who pass knowledge to other founders in a pay-forward model in small intimate learning sessions. Aneesh Reddy, Pallav Nadhani, Amit Somani, Amit Ranjan, Avlesh Singh, Deepa Bachu, Deepak Prakash, Girish Mathrubootham, Niraj Ranjan, Jay Pullur, Paras Chopra, Pravin Jadhav, Rushabh Mehta, Samir Palnitkar, Sanjay Shah, Shankar Maruwada, Suresh Sambandam. 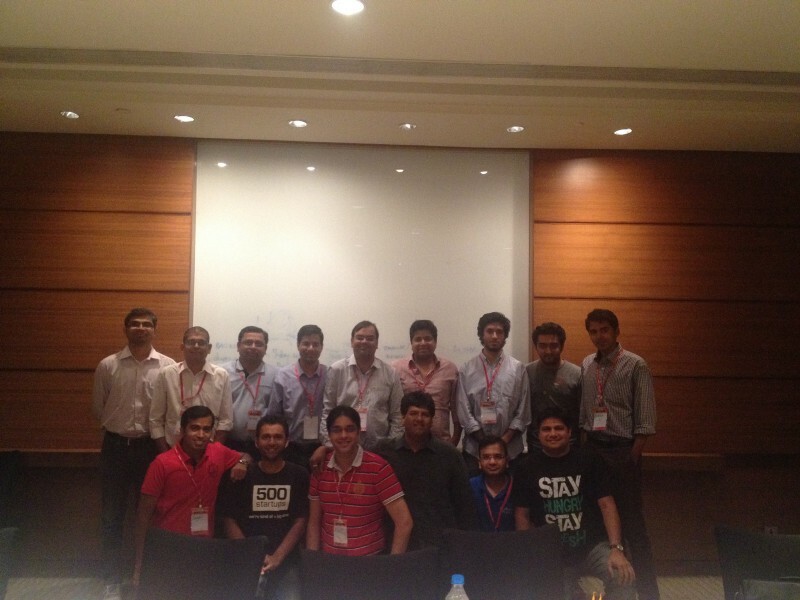 Vivek Subramanyam, Sudheer Koneru, Ambarish Gupta, Phanindra Sama, Abhishek Sinha, Ashwin Ramesh, Shashank ND, Shivakumar Ganesan(Shivku), Krish Subramaniam, Ankit Oberoi, Arpit Rai, Varun Shoor, Dhruv Shenoy, Manav Garg, Naveen Gupta, Rajiv Srivatsa, Sampad Swain, Kailash Katkar. 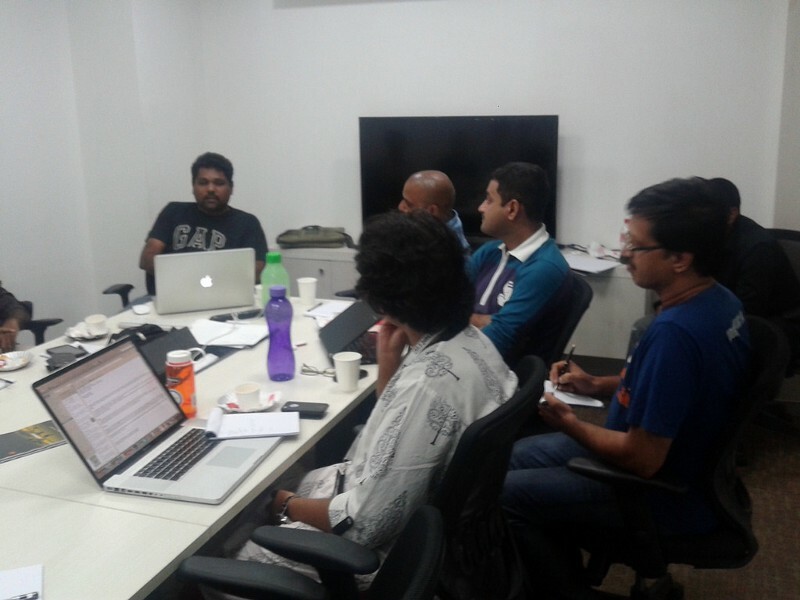 Special thanks to Niraj Ranjan Rout(Hiver) & Rushabh Mehta(ERPnext) for introducing the new format i.e the Tear Down sessions and helping early stage(pre-product market fit) companies on helping them find their product market fit. Thanks to you who make time in your incredibly busy lives to make these sessions happen. 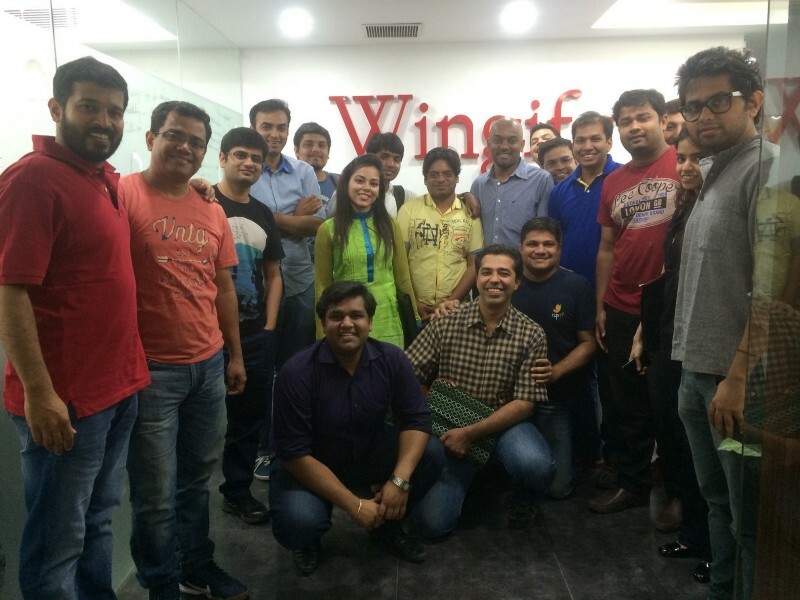 Delhi-NCR — Eko, Investopad, Posist, Wingify, AdPushup, Kayako, Knowlarity. 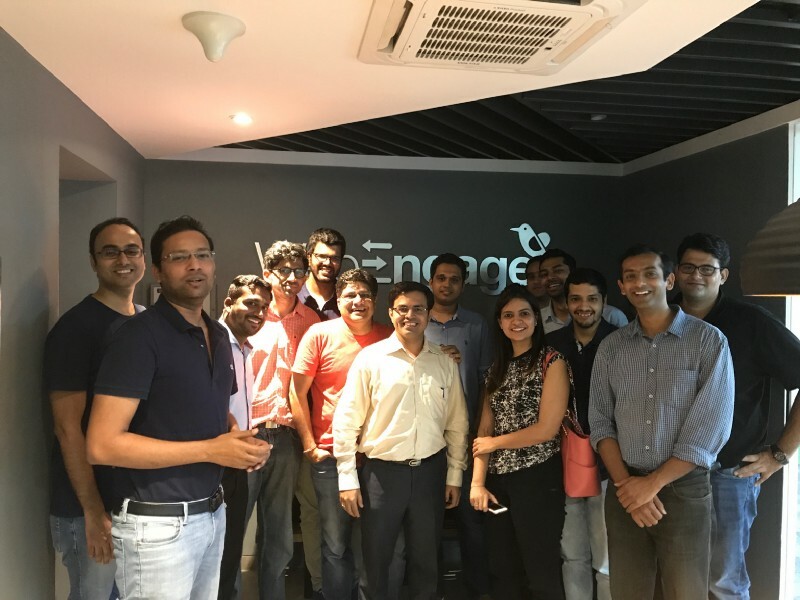 Bangalore — Exotel, Vizury, iCreate(Fintellix), Capillary, Instamojo, Hotelogix, Helion, Accel, DeckApp, SignEasy, Belong, HiverHq, Practo, RazorPay, Synup, UrbanLadder, 24/7 Customer, Elitmus, Srishti Software. 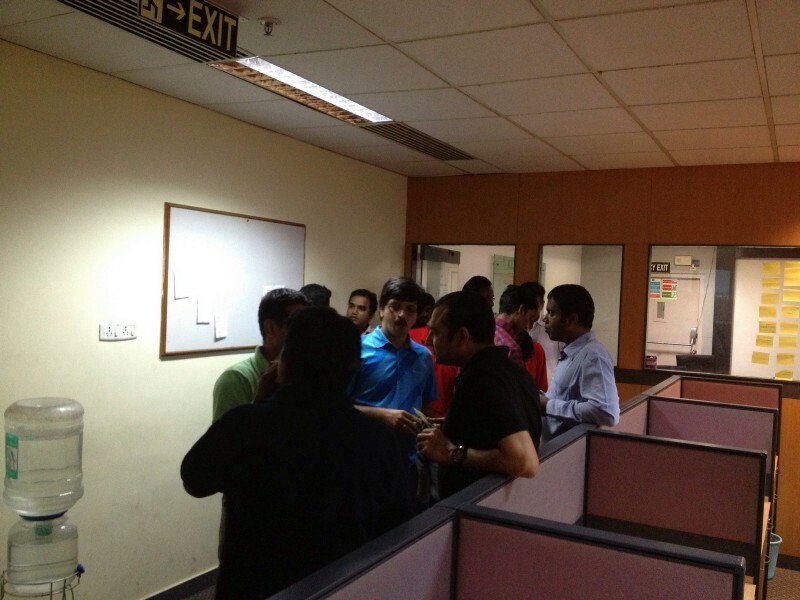 Pune — QuickHeal, HelpShift, Pubmatic, Sokrati, TouchMagix, K-Point. Mumbai — WebEngage, FreeCharge, WishBerry, LightBox, BrowserStack. 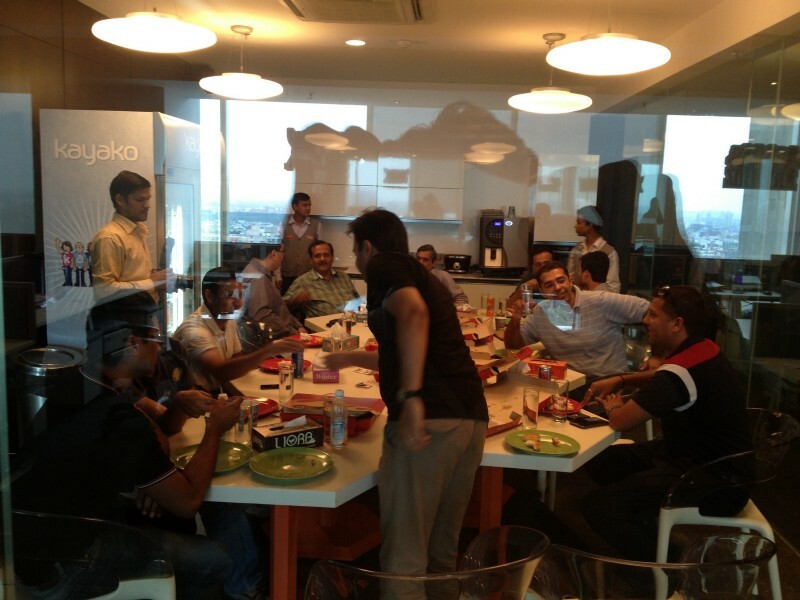 Chennai — OrangeScape, Freshdesk, Chargebee, Zarget. Hyderabad — Ozonetel, Pramati, Zenoti. Many volunteers who have helped in writing blogs for and about the sessions and also help in editing some of my blogs… especially Sairam Krishnan & Kingston David. 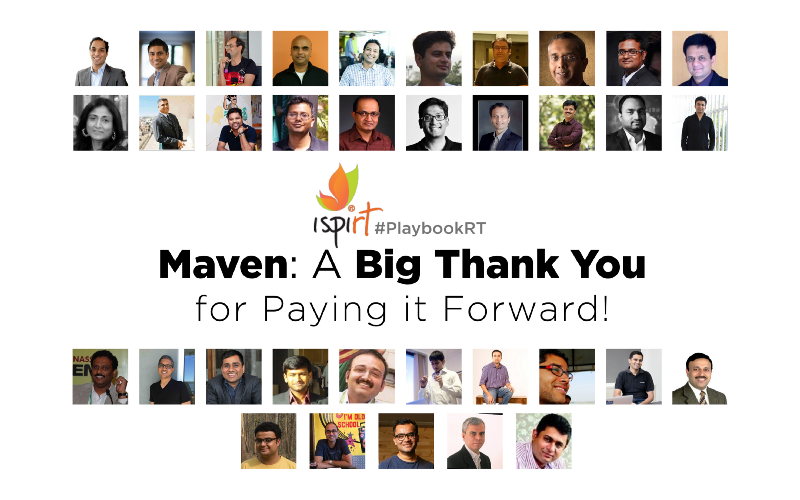 There are around 1000+ Founders who have leveraged the playbooks and the list can be accessed here. Iam really glad that I will participating at the 100th Playbook Roundtable in Chennai on “Inbound Marketing — Workshop for DIY Global SaaS Startups”. 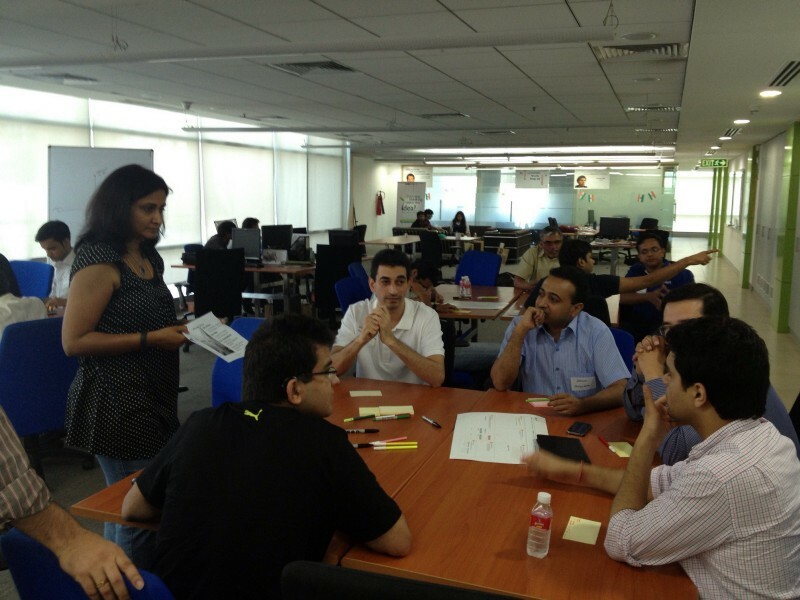 This would be led by Krish of ChargeBee & Suresh of KiSSFlow. This marks an incredible milestone since our journey began in 2013, and demonstrates the increasing demand for our playbooks every year. Circling back to my cricket story at the start of this write-up, we all start with an outrageous dream. It is definitely good to dream big but when there is a bigger calling, we should yield to it! I am so very proud that we’ve reached this milestone. Thank you for your support, and I look forward to celebrating more milestones together in the future. There are hundreds of big and small moments that have made up this journey so far — it is impossible to capture them all here, but I am sharing some of these moments via this photo story — I hope to give you a flavour of the energy and spirit of what made us reach 100! A PlayBook RoundTable without Post-its is unthinkable! Building great products requires us to understand customer needs and its nuances, are more often than not, counter-intuitive to our assumptions. 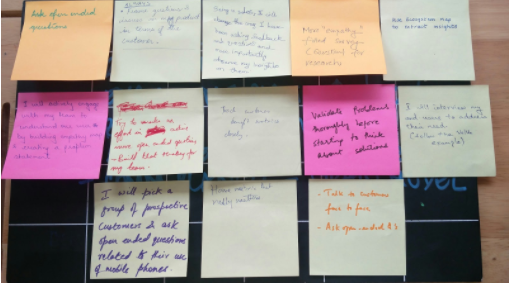 The Design Thinking Roundtable session by Deepa Bachu helped us identify methods to bridge this gap between building great products and understanding customer need. I was lucky enough to be part of the small group of product managers, designers, and fellow entrepreneurs to have an engaging discussion onimportance of design as an innovation strategy. How well do you know your customer? After knowing who your customer is, the ascent for a better product begins with sitting down with the end user in an amicable environment to learn about their challenges and their day to day experience. Deepa pointed out the importance of empathy, active listening and observation to help capture the end-user’s experience. Her role play exercise with one of the participants around the difference in the approach on asking open-ended questions while actively listening and observing delivered a completely different set of answers, in comparison to when as an interviewer she was asking closed ended questions and was not actively listening. In short, let your customer speak & take notes!! 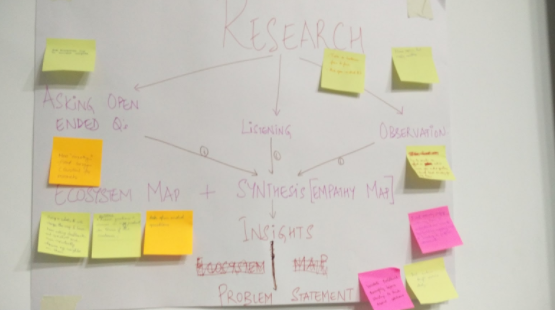 Ecosystem Maps help us understand the customer’s environment and his / her ecosystem. A map to tell us the sequence of events that are leading upto our solution or after the solution. Problem Statement helps us see the customer’sview point and their emotionalconnect to the problem. From a product point of view, we can turn a poor customer experience into customer delight by evoking the right positive emotion after using our product. Mind you, these folks are your product advocates. The core of design principles is not nailing your UI/UX, it is matching your customer need, the problem they are facing in the environment they are using / will use our product. Only when the experience matches this customer need will we really see true customer benefit. Value addition of this benefit requires the need to collect the right metrics to understand if we genuinely made a difference instead of vanity metrics like just increased downloads / users. By understanding our genuine impact, we can course-correct our product with continuous improvement coupled with rapid prototyping to help us slowly move towards our product goals and vision. 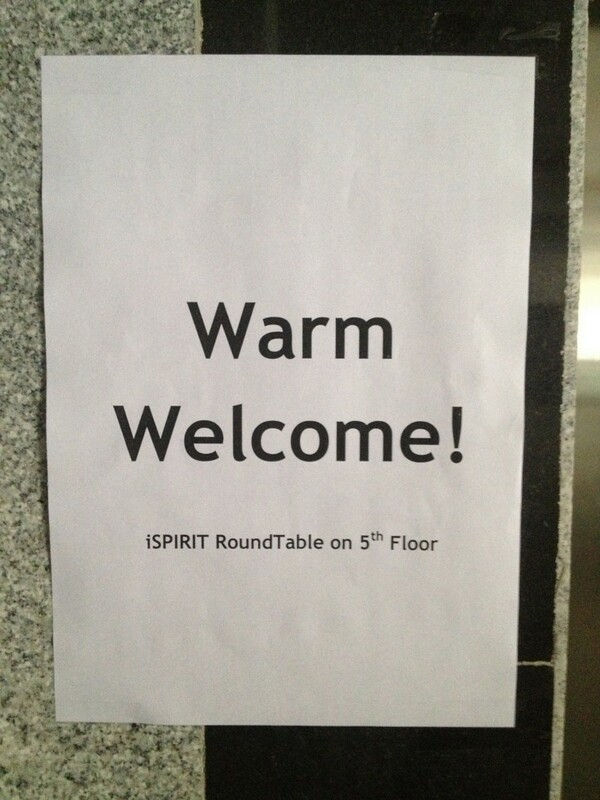 What’s the one thing participants will do differently after the #RoundTable? Overall a great learning experience thanks to Pensaar and iSPIRT for setting up this session. By Rohit Krishnam, Co-founder of Lima Payments. 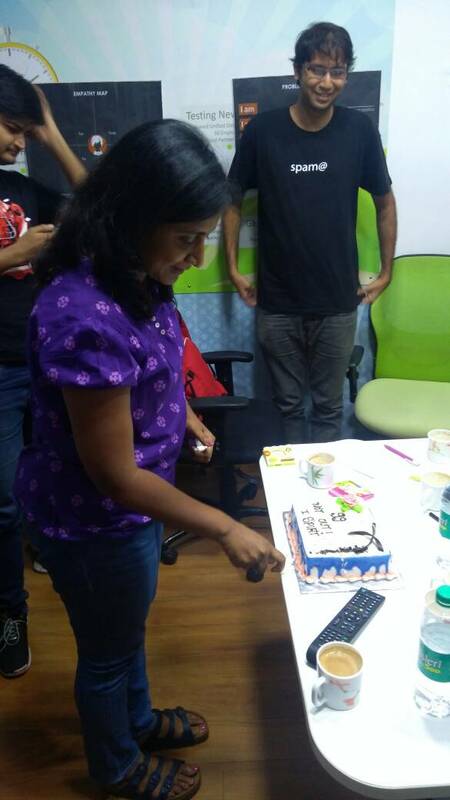 Editor’s Note: This #RoundTable happened to the 99th one and there was a small celebration on this occasion. It’s been a great journey so far and we’d like to thank all the participants, facilitators and volunteers who made this possible. Here’s to making India a Product Nation. Ask any entrepreneur, and they will say, well, this is the story of my life. Owning a business is one of the most cognitively challenging jobs. To move from a stable job with a steady income to one where uncertainty is the flavor of the day every day takes courage, competence and confidence. Most of all, it requires an emotional tolerance strong enough to deal with the pressures of change and unpredictability, not to mention the mental fortitude to navigate through it. 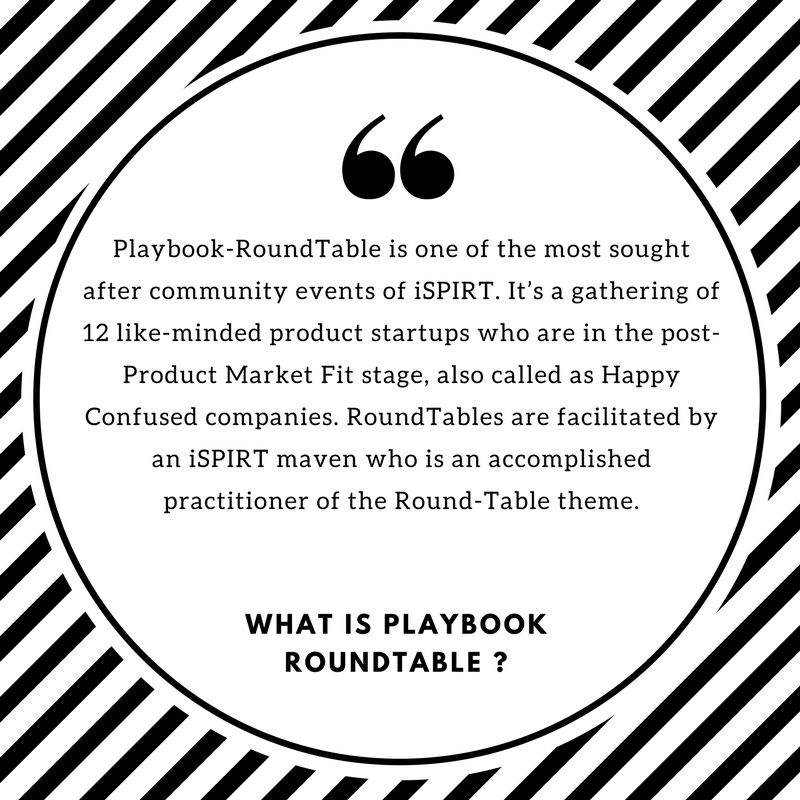 As iSPIRT approaches its 100th Playbook Roundtable, Avinash conceived the idea of a completely different roundtable theme. One that focused not on strategies and tactics that a founder could apply to his product but one that focused more on the tremendous evolution that an entrepreneur goes through in his or her journey. And who better than Abhishek Sinha of Eko to facilitate such a roundtable. 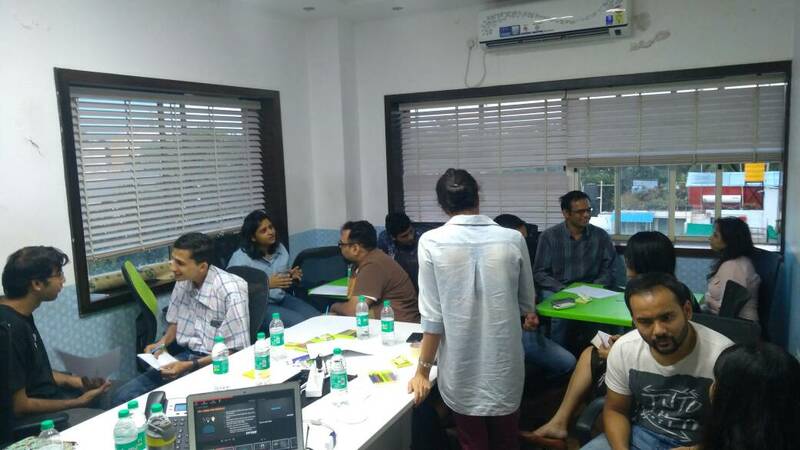 The playbook was held at Eko’s office on 3rd June 2017 with a select set of entrepreneurs in the Delhi NCR region. 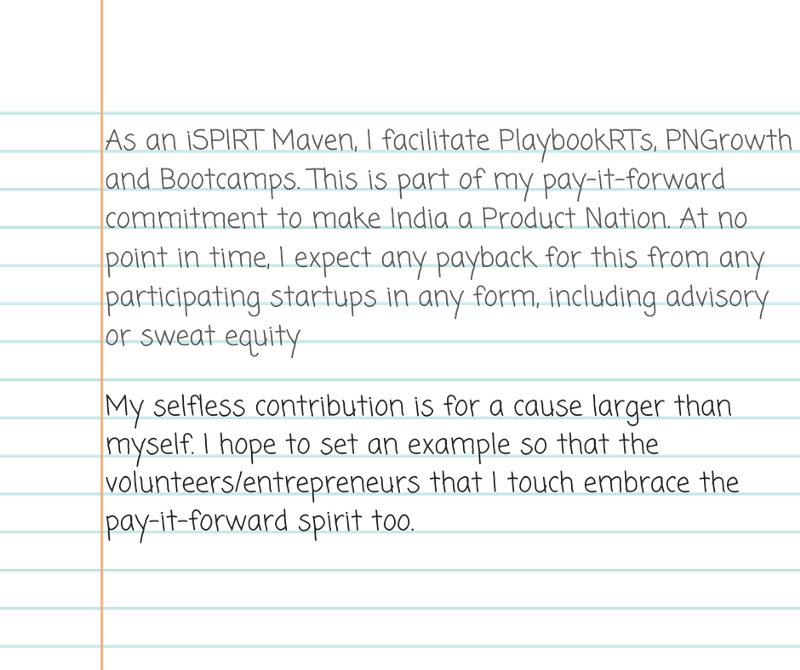 Taking a leaf from Jeff Bezos’s playbook, Abhishek drafted a 6 pager that covered important phases in his entrepreneurial journey, and all the participants spent the first 30 mins going through it. In this 6 pager, Abhishek shared real life stories all through his journey of 6d and Eko. These stories touched upon how he became desperate and did more of the same. How he understood for the very first time that it is critical to think different. How he attempted at thinking big and audacious. Why being young and with it being foolish and naïve helped. Once one has started on a big goal why it is critical to developing the understanding of the landscape especially regulations. How he learned the importance of execution, scaling and making money. The mistakes he made when Sequoia and Khosla wanted to write cheques and he couldn’t close the deal. More importantly the lows in his personal life and how he sought help to get things back on track. How he has personally exhausted all options to lose and hence winning is the only option. Today, as a battle-hardened entrepreneur, why he has the conviction of success. Most of us started on the entrepreneurship journey with the idea to create something cool or do something fun. It was never about creating a billion dollar business. There was a lot of pureness to this thought as we went about solving one problem at a time, and having fun. But slowly we stop enjoying ourselves. We stop thinking differently and start doing the same thing again, and again. This brings in predictability but stops us from experimenting different things. So when you are questioning your journey and your growth (success or lack their off), just remember you are where you are supposed to be. It will work out fine, just trust in your journey. Sit back and relax and enjoy the ride. You will be surprised where it takes you. Once you get to the top of the mountain you may come to miss the fields below. So take the climb one step at a time and enjoy the journey, entrepreneurs. Abhishek reflected on near-death experiences in his business and how he managed to get over it. He hasn’t been able to put my head around why a certain deal fails and why one succeeds. Ambarish from Knowlarity too chimed with a similar thought where atleast one or 5 occassions, something happened that kept him and his business going. If one simply applies theories of probability to these random events, the result becomes even more inexplicable. This has driven Abhishek towards the realm of spirituality and over a time trust in a higher energy which has taken care of him. He has become a strong believer in destiny and a higher power, and that if we pursue our dreams the doors will open up. At the risk of being cheeky, I couldn’t help but share this SRK dialogue. Believing in destiny though is not about sitting back, and letting whatever is happening to happen. A sense of purpose truly comes from within, and you can’t find meaning with a company that doesn’t share your values. So one of the simplest ways to cultivate a meaningful workplace is to stack your team with people who share the passions of your company. When everyone is aligned as a part of a bigger movement — that’s when the true meaning behind your work (and your company) shines through. Entrepreneurs are problem solvers and product people, and are able to spot patterns & problems in the current scheme of things, and the relevant solutions very easily. And we immediately get our teams to work on the solution. This is a bottom up approach. You instruct an employee to perform a task or even accomplish a goal. But in effect you still own that task or goal. You tell the employee what you want, you define success and you create metrics to measure that success. That’s accountability. The employee takes responsibility for getting done what you want. However a top down approach requires entrepreneur to only mention the problem to the teams and outline the contours, and let them come with the solution. This requires patience, and as more often than not, the solution will be staring right at your face while team members will go though their own curve before they discover it. But once the team members do come up with the solution, there is more ownership as this is now their baby. If you only have one or two employees and you love to micromanage, you can get by with hiring people you will simply hold accountable. But if you’re truly trying to scale your business for growth, micromanagement soon fails. There is simply no way a chief can be involved in every task, process and decision. If you foster a culture of ownership, you don’t need to be involved in every detail. You can focus your attention elsewhere, secure in the knowledge that owners will always come to you when they have problems or need help. It’s not about doing more or better, it’s about doing different. If you can create that which is new and different you stand a greater chance of success. You can find white spaces that you can fill in. When you break rules, you experience something unique. Ensure you savor this uniqueness even if your ideas bomb because these unique and different efforts will create experiences that themselves are unique. An entrepreneur often needs to play mental games with himself or herself. These games allow you to challenge yourself and create a crisis in your mind that pushes you to think creatively and innovate. If fear of the unknown has you tied down, try this: after you find yourself posing the “what if?” question to yourself, answer it. By doing so you bring that unknown fear into reality and make it more tangible and certain. With certainty comes clarity and with clarity comes opportunity to crush all challenges. Having safety nets or diversions lead to entrepreneurs loosing focus. It sometimes become imperative to remove these safety nets. When you have safety nets, you are not all in. It makes you timid to jump in with both feet. But when you remove all these safety nets, you have only one choice: take the leap. Having your back against the wall you are forced to go all in, forced to make it work, forced to believe in yourself. The session culminated with Abhishek sharing how he is taking inspiration from the Android model and smartphones that creates an unbundled experience for consumers. Feature phone could do (i) calling (ii) messaging (iii) entertainment / games (iv) value added services like calendar, alarm, notes etc. Though all these are fairly tightly bundled and hence customer couldn’t exercise choice – take it or leave it. Smartphone is an unbundled architecture. It offers the same four functionalities though as its architecture is completely unbundled and open – it empowers the customer to make the choice basis their transaction scenario / context and cost. A similar framework could be applied to several industries to create unique products and solutions. As the session ended, one could sense how Abhishek had been socialised to the highs and lows of business life. The mental game of entrepreneurship often feels like Snakes and Ladders. There were days for Abhishek when he just wanted to run away, where he felt as if he was in freefall and plummeting to the ground without a parachute. But, looking back, those are the moments that defined him. He has accepted – sometimes with a lot of delay and a good fight – that he was the architect of the bad situations and he accepted full responsibility for them. That is how he bought his freedom. It’s only by acknowledging your failures that you can build on your successes. 0 – 100 customers! How fast can your SaaS startup accelerate? The toughest challenge in your startup journey is getting to the milestone of first 100 customers. 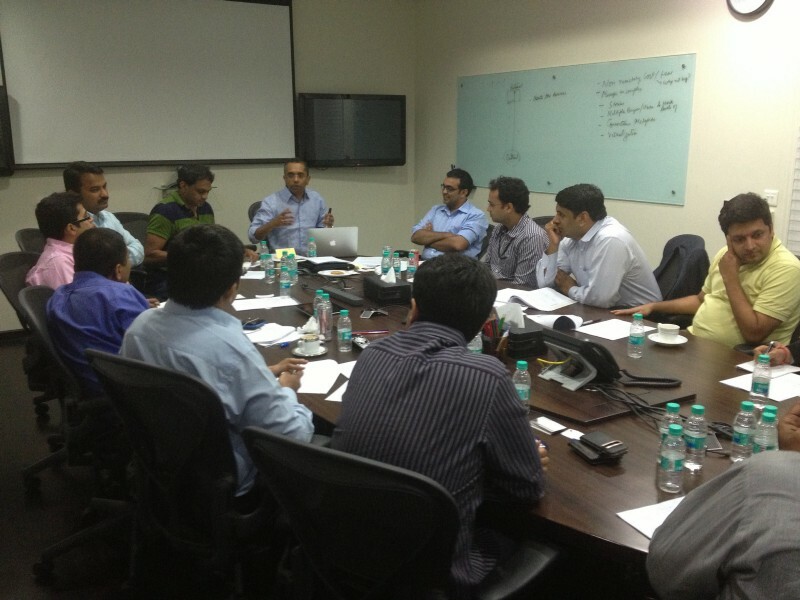 iSPIRT’s 97th PlayBook RoundTable, ‘Zero to One’ was held last Saturday in the hot and humid city of Chennai. 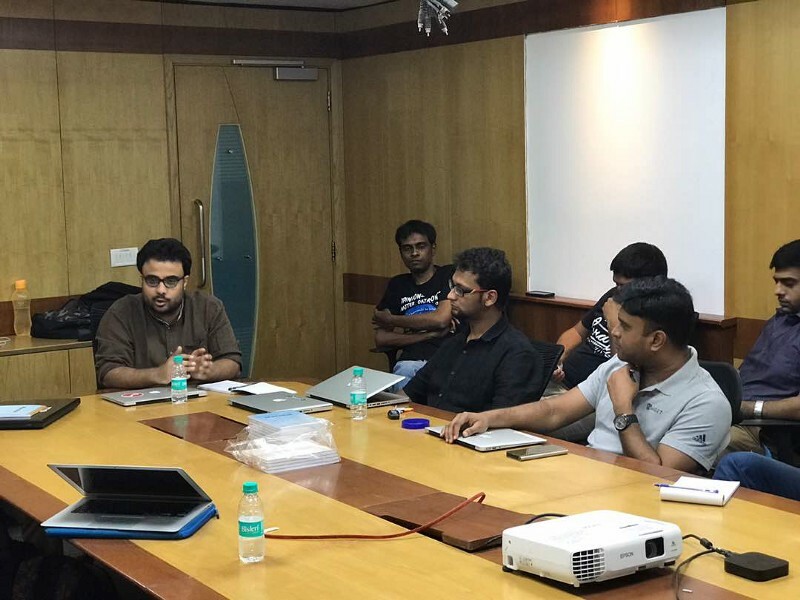 Ankit Oberoi from AdPushUp moderated the RoundTable which was attended by 13 other startup founders eager to know how to crack this. The PlayBook didn’t have formal presentations but rather involved everyone into an engaging conversation that was both informal as well as informative. First things first, as early stage SaaS startups, “Kneel down and build your product well, when bootstrapped” was Ankit’s advice. Emphasis was made on identifying your target customers to help you build the right inbound and outbound strategies. Ankit mentioned that a good way to find your target customer type is to look at your top ten customers. Few entrepreneurs looking to generate quick revenue might tend to drift towards a service model. Arvind Parthiban, CEO of Zarget had an insight on this trend — “Going the service way will work only if one can scale up right and maintain profitability in the longer run”. Just creating content will not cut it! You need to market it right to do justice to its quality. Though it is a painfully long process, bootstrapped startups have the luxury of time and they should invest in building on content strategies around long tail keywords. Much emphasis was given as to why content should be created for personas. An example that was pointed out for this was Groove’s blog where the focus is exclusively on founders. It is right for early-stage startups to focus on generating traffic through content but the real focus should be on giving value to the readers. Conversions can happen even later and not necessarily while reading your content. Growing a subscription list through your blog is not only a no-brainer, but a must have item in your growth stack . Ankit stressed on how Neil Patel talks about why you need to urge your readers to subscribe right from the start. When you have a subscribers list, you can nurture them to share your content and build a bigger subscribers list which will ultimately increase your brand value and improve your customer base. Initial days of your startup journey are when you can do such things that take time to scale. Buyer intent content are the ones written with the focus on ranking higher on search engines. These should have focus on keywords and the main objective of these content pieces are to sell your product. Value intent is when you become a Thought Leader of the industry you are in. Helping your customer persona should be the name of the game when you generate such content. At times, you don’t even have to put a link back to your product when you write such content. Educative long form content with simple writing works best. 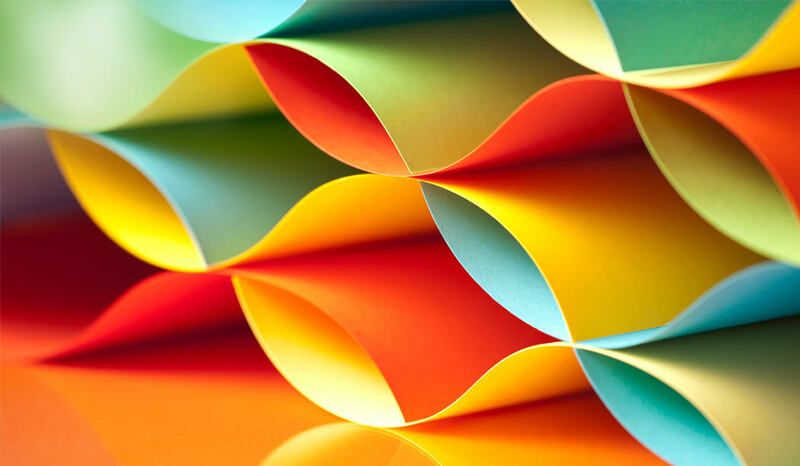 Just like content writing, content distribution too has to be categorized based on intent. Be spot on with your content! Creating a content calendar is a must! Knowledge sharing on this topic pointed out that the calendar should be finalized, ideally, in the first few days of the month. Decide on buyer intent topics with the help of keyword planners. 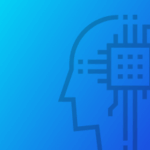 Thought leader articles can be written with the help of community platforms — find answers for the most-asked questions. Quora is a gold mine to search for blog ideas. 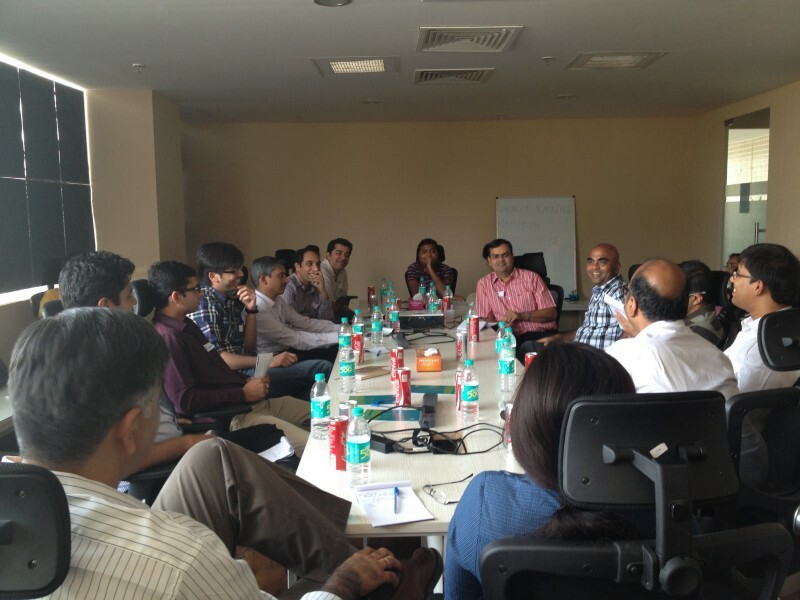 The consensus from the more experienced entrepreneurs at the RoundTable was that content has to be tested too. The headline is the most important bit of your article/blog. Ankit spoke about how 75% of your readers don’t actually read your content but rather scan for information. He shared a personal insight on how just a headline change helped AdPushUp make an article go viral overnight! Check out this article here. As much as headlines, the first few lines matter too! In fact, most people who share an article actually read the intro and then skim through the article. Sharing happens not because people read it fully but because they feel it is relatable to something they would read and want to express to their circles about the type of content they would read. Your formatting should be spot on to help them digest your post in just a few seconds! Headlines need to be tested extensively. Vengat from Klenty stressed on how testing one variable at a time is imperative for success. Ankit talked about how he narrows it down from a couple dozen headlines for their blogs. A/B test between the best ones to ensure you get the best variation. Summarizing Comprehensive Blogs — Found something useful? Write a brief, original summary of the blog. This will rank organically. Ensure author credits are given. Skyscraper Technique — Find an awesome content and piggyback on it. 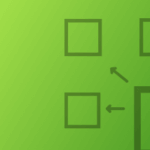 Find linkable assets, make it better by adding in your thoughts or collating ideas. Reach out to the authors of the post and share it on social media. While on the topic of Content Marketing, the topic of paid promotions came into play and it was agreed upon that paid promotion for articles should be done with the intent only to hit a critical mass. With paid promotions, readership is not improved but only the views are artificially increased. A good insight from one of the attendees was to try and push notifications about blogs through live chat platforms like Intercom. There are two types of talent you need on your inbound team for achieving success in your content marketing endeavours. The hustlers & the experts. Hustlers are those who understand the market and the distribution channels while the experts should be the ones strong in content. AIESEC is one hiring venue that you should consider for smart and affordable talent. You need to break down your web analytics — group traffic sources and optimize for each and every source. Ankit explained how Google not only ranks posts but also pulls down posts with the help of Ryan Fishkin’s social experiment. He urged people to open a top ranked post and immediately go back to the search results page. The search engine bots picked this up and realized people no longer find the post valuable and dropped it by one position! We live in a smart world! And to outsmart Search Engines, you need smarter content tactics. Arvind and Ankit then shared their experiences with events generating brand value and how that indirectly helps your inbound conversions. PR is yet another way of getting social approval. It reduces sales cycle as well as helps with search engine rankings. Vengat shared his learnings from Prodpad’s gamification for trial users that kept urging for additional actions for trial extension. This would inevitably lead to more activation. Ankit stressed on the fact that if a startup concentrates well on inbound tactics and is all set for the long run, outbound becomes considerably easier. Most US companies go all out on inbound tactics. Being in India, we have the luxury to work on outbound marketing at relatively cheap costs. Tools like BuiltWith, Datanyze, SimilarWeb are in this space. The problem to be addressed would be scaling the process without expanding the existing team. As you reach out to more and more people, the data bulk can be huge to handle if you don’t automate/semi-automate the process. An entrepreneur’s journey is one to be cherished and the initial acceleration from 0–100 customers is enjoyable though dotted with challenges. 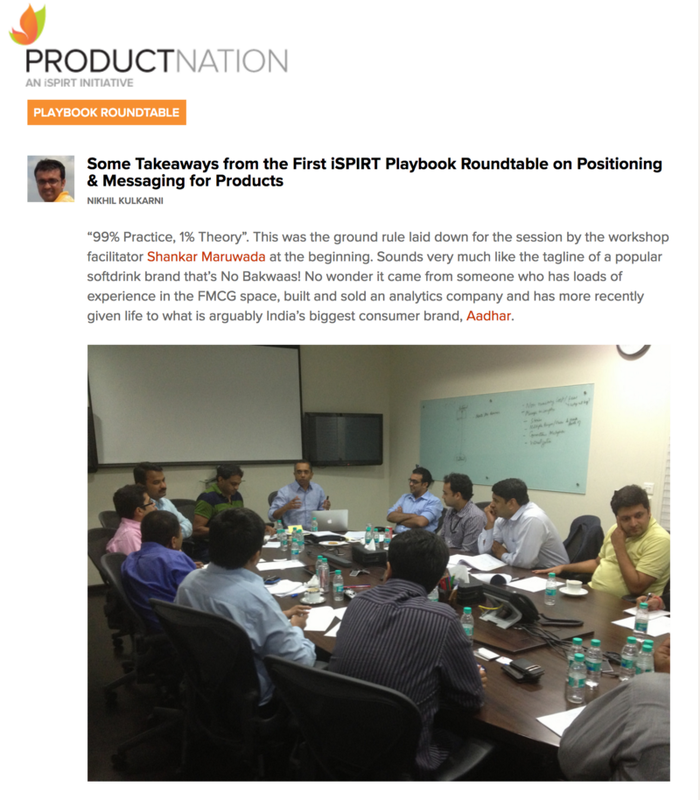 The 97th Product Nation PlayBook RoundTable turned out to be a learning experience for everyone who attended and hope this article threw light on what was discussed to those who weren’t lucky enough to be part of it.